*** VRBO quotes do NOT include car passes! Please call or submit an inquiry to receive a full rental quote! Restraurant parking after 5:00 pm will be on a first come-first served basis. The Beach Shuttle will operate from March 23, 2019, through September 2, 2019 (Labor Day) from 9 AM- 5 PM, seven days a week. 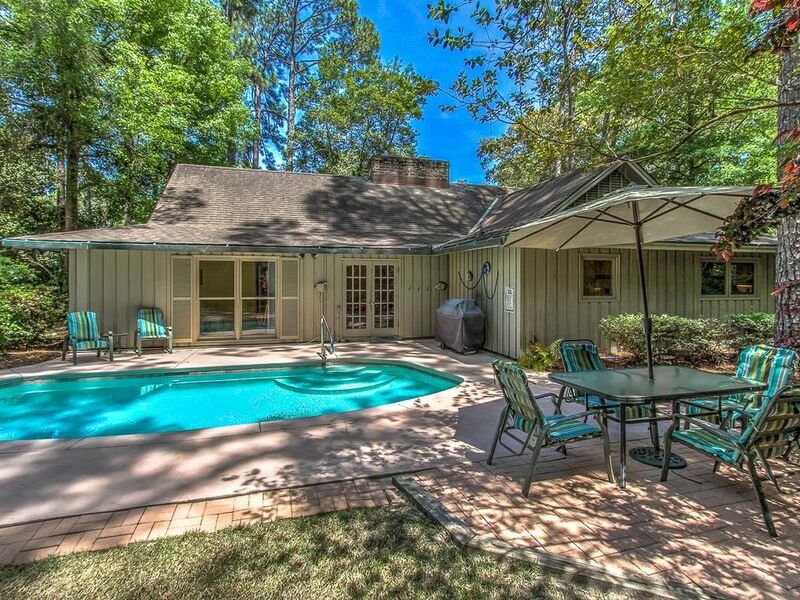 17 Old Military is a comfortable private home with a private pool located in a quiet residential neighborhood in Sea Pines Plantation. This 4 bedroom, 3 bath home is just a 5 minute bike ride or a 10 minute walk to the beach. This delightful home has a flat screen TV in the living room, leather couch, and loveseat with built-in footrest. There is also a separate den area, great for relaxing with a good book after a long day at the beach. The dining area leads into the updated eat-in kitchen featuring wood floors, 2 ovens, granite counters and a beautiful brick archway. The master bedroom with a queen bed has a private bath with a large tub, separate shower, and double sinks. The king bedroom has a pool view and a private combination tub/shower bath with bright yellow walls. The 3rd bedroom with a double bed shares the turquoise bathroom with the 4th room. This last bedroom has two twin beds. 17 Old Military has a nice front yard with tall trees and landscaping. The backyard is very peaceful with lots of privacy. The pool has a cement patio and a small grass yard. This home is sure to provide a memorable vacation for your family. Please call or send email inquiry for stays longer than one week. Online quotes do NOT calculate correctly for longer term rentals OR for stays overlapping two different rate periods. Monthly rentals are four full weeks, Saturday - Saturday. Call for Specials and Hot Deals. Mention you saw it on VRBO.